Catholic charity Apostleship of the Sea (AoS) wants to help pupils understand the role seafarers play in their lives and in the world they live in. An estimated 95% of the goods we use or consume in the UK arrive by sea. Andy Lewis, head of year 10 and assistant subject leader in RE at Sacred Heart of Mary Girls' School, Upminster, London. AoS is the Catholic Church’s maritime agency, providing pastoral care and practical help to the seafarers who arrive each day at ports around the country. Its network of port chaplains and volunteer ship visitors are often a lifeline to seafarers, most of whom come from the developing world. It also provides chaplains to cruise ships, serving both the crew and passengers. The subject of the sea and seafarers links to many aspects of the National Curriculum, including trade, food, economics, transportation, globalisation, poverty, human rights, and social justice. 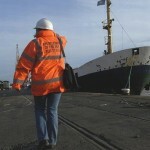 “There are some 100,000 ships at sea crewed by more than 1.5 million seafarers. It is a world that is often so close to children from seaside trips and ferry crossings, but relatively unknown to them,” said AoS Director of Development John Green. AoS can provide a free speaker to lead a school assembly to help KS2 or KS3 students become more aware of the importance of seafarers in daily life and how the Church offers help. The assembly has been produced by teachers in partnership with Ten Ten and is in line with the National Curriculum.